While there is a plethora of information out there about hiking the Appalachian Trail I realized there isn’t that much on the Florida Trail. Sure there’s the guidebook and other forums and some trail journals, but what about some of the logistics? You can ask a question on Whiteblaze about the AT and get an answer quickly. Heck, you don’t even have to ask the question, usually a quick search will bring you what you are looking for. I was talking with my AT friend, Merf, who is contemplating doing the FT this coming winter and told her I’d write something up for her. But then I realized that I should do a post on it for everyone else. What helped Chris and I to begin with on the FT was that we were already familiar with it since we’d lived in Florida for eight years. We’d done some sections and so we knew some of what to expect. We weren’t flying blind like the AT. The other good thing was we’d already done one long distance trail so we knew how to pack, how to plan and what exactly to do in the wild. This little guide isn’t a be-all-and-end-all guide. It’s what we did and what I feel worked well for us. If you have any other particular questions feel free to drop me a line. 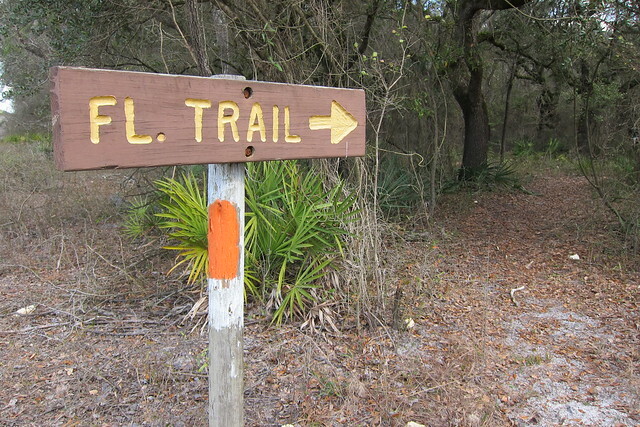 Before you go on your hike you will need to contact the Florida Trail Association. They will send you a thru-hiker pack with information on the hike, including forms that are required to be filled out for the Seminole Indian Reservation as well as the Eglin Air Force Base. I also suggest buying the Florida Trail maps and guidebook. This isn’t like the AT where the guidebook is all you need, the maps are vital to figuring out some turns and road walk sections that might be inadequately blazed. They are there and inevitable until the trail is moved off them. The two more notorious sections, Big Cypress and Apalachicola, will involve wading in water from a few inches to knee deep in some areas. Some spots are short, some aren’t. Also, the trail can flood after a rain. More on that below. A lot of folks are used to hiking in mountains, so you will have to look at the views and vistas of Florida differently. There are some rolling sections in the north and panhandle, but nothing of consequence. Accept that Florida is flat and enjoy it for what it is, a nice piece of sub-tropical land that houses quite a few areas of unique habitat that you won’t find anywhere else. There are very few shelters along this trail, so few that I can count them on one hand. If you’ve done the AT and slept in shelters most of the time you’ll need to find another alternative for this trail. A hammock will work, but there are some stretches along levees and Lake Okeechobee where there are no trees to hang your hammock, so you might sleep on the ground with a tarp instead. Florida is humid and so condensation will plague your tent/shelter. We had to take ours out at lunch daily to dry out and if we forgot we’d have to set it up as soon as we got to camp and hope it was dry by the time we wanted to get in it. A three season tent will work fine. As for camping locations, for the most part there are also very few designated campsites. Even if there is a designated campsite you may not want to stay at them due to where your mileage puts you, so stealthing is always an option. Except in the areas you traverse owned by the U.S. Military. Don’t risk it. Just camp where you are supposed to or get through the area that day to camp elsewhere. I’m talking about Eglin AFB and two other military bombing ranges. There are also stretches on road walks that do not provide camping access. Unless you are hiking with support more than likely you will need to do some tricky stealthing. Or asking permission behind a store or the like. These aren’t 5 and 10 mile stretches, more like the 30+ mile stretches that will cause you to be in these types of situations. Some of them you might be able to maneuver around and get through in a day doing big miles, like we did between Blountstown and Econfina Creek, but others prove more difficult. Look at your map several days in advance to plan out where you might end up. If you have a particular question on an area, feel free to email me for more direct information on where we camped….but I can’t verify that it is a safe or legal place to stay. That’s your decision and liability. If a property owner or police officer asks you to leave, do it. Oh, and there are rarely privies. Dig a hole and follow leave no trace ethics. Water is for the most part plentiful. 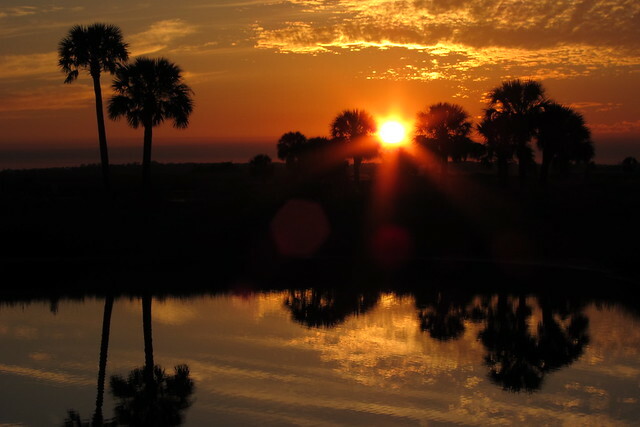 In the south you will find it in the cypress domes and sloughs as well as in canals and Lake Okeechobee. Anything in peninsular Florida will come in the form of a pond, small lake, river or canal. You will need to filter or treat this water. It will also be tannin colored, ie: looking like strong tea. It doesn’t taste bad and if it is in the hydration system of your pack you won’t know any better. I suggest using a filter for this water to get rid of some of the debris that might be in it. You could come across clear running tannin colored water and might use drops instead. We carried both a filter and drops and switched to using drops when we started hitting springs up north. Send an extra filter cartridge in a mail drop to switch out half way through. In general we did not have problems finding water to drink, however in a really dry year it could be trickier. Winter is the ‘dry’ season for Florida. If you don’t know Florida seasons, there are two: wet and dry. What is good about the dry season is that in general you don’t have to wade in water like you would in the summer. I say “in general” because you will cross some wet sections, particularly if the dry season hasn’t fully hit yet. 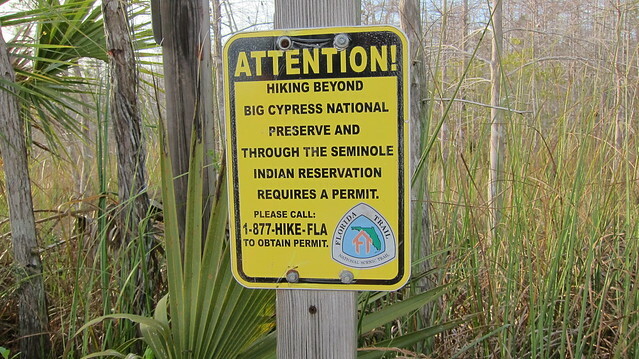 We had some water in Big Cypress when we went through, however we have also hiked that section when it was bone dry and water wasn’t even available in the cypress domes. If it happens to rain, low spots will become soggy so that is to be expected in some parts of the FT. For the most part you should stay fairly dry. The next ‘wet’ section would be in Apalachicola when crossing through the ti-ti sloughs. It is also possible to get wet after a rain event when crossing swollen creeks leading into the Suwanee River. We had a friend drop food off to us at the Big Cypress RV Campground (also a good place to stay, shower and do laundry) but once there we realized that a quick call ahead would result in this being a good place to to mail a food drop. There are also a couple of gas stations on C.R. 833 to the south of where the FT goes, but they are off trail and probably not the best resupply, but an option nonetheless. This is an easy jaunt into this tiny agricultural town. The grocery store in town has plenty of resupply options. Plus, a Burger King makes a great place for greasy calories. Here we called a trail angel to get a ride into Okeechobee, which otherwise if going in this direction around the lake is three extra mile to the east. 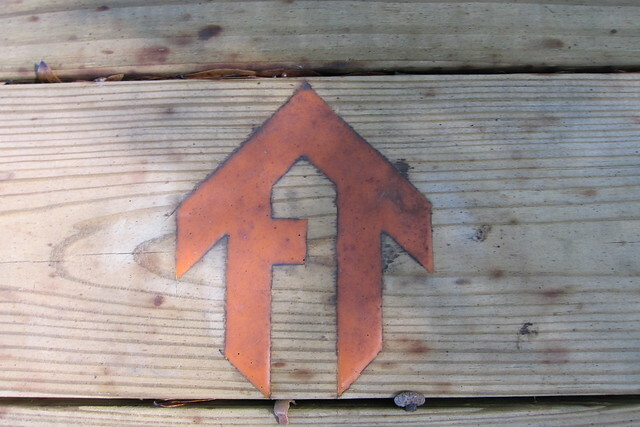 The FTA will send out a trail angel list for people servicing particular areas when you get your thru-hiker packet. Give them a call ahead of time to see if they are willing to shuttle you into town for a resupply. We got a hold of trail angel Lori for this section and resupplied here. Unless you want to go off trail by hitching in the coming miles, a big resupply is needed here. There are no nearby, easily accessible towns for awhile. We did not resuppply here but this middle of nowhere resort has a post office. Contact River Ranch or the post office on site for a possible mail drop. If absolutely needed there is a general store/sandwich shop that could provide food in a pinch. We saw a lot of canned goods though, so you might have trouble finding light weight options. This would be a good place to split up the distance if needed. We resupplied here with a friend who dropped food off for us, however you could hitch into Keanansvile from here. Because we’d planned our resupply with the book instead of looking at the maps too, we didn’t realize that the trail had been rerouted from downtown Chuluota and went around the town instead. Luckily we had enough food because we’d been doing bigger miles, but don’t count on this one if you are going by the guidebook. Once you reach the Orlando metro area at Oveido there will be many options for resupply. The best, though, is a Publix grocery store in Lake Mary, just over the I-4 bridge to the north. In the heart of Ocala National Forest, I highly recommend sending a mail drop to this convenience store/bar. It is probably the only place on the FT that has the sense of camaraderie and overall ‘trailness’ that you might find on the AT. They will definitely hold packages, just call in advance to double check about ownership etc, and there is a nice blue blaze off the FT to get to the store. You can also pay for a shower and get permission to camp behind the store if you imbibe a few too many beers when you arrive. The trail goes right through this town and there are several restaurants and fast-food places to eat at here. There’s also a great grocery store and two-dollar stores for resupply. We did a mail drop here and after going through this town I still recommend a drop. There is no longer a grocery store, and the outfitter that used to be in town is now several miles out of town. There are a few gas stations and a Dollar General for extras, but get a mail drop. This was also the one town where the postmaster told us he’d hold our box for only a certain amount of time before sending it back. So, be careful about when you have your family/friends at home send your box. We got stuck here because while the trail angel list says folks will service this area, they are actually quite far away. The one person who might have been able to help us was doing a hike that weekend only about 10 miles behind us. So, we opted for hitching north to Shady Grove, a tiny, blinking light kind of town. Our resupply was the ‘general store’ aka: an overpriced gas station. But, we got what we needed and only had to make it a few days before the next resupply. We opted to hitch to Shady Grove despite Perry being a bigger town. We thought it might be more difficult to get out of Perry if we were deep inside the city at a Walmart. This is a teeny-tiny fishing village of a town. We resupplied at the very small grocery store. There were some very old items on the shelves, too, but we managed to put together a resupply. If you are staying at one of the fishing cabins that will shuttle you across the St. Marks river (instead of hitching a boat) you might be able to do a drop there. You could stop in Bristol and go off trail to the grocery store there or go off trail in Blountstown to the grocery store. Since we stayed at a motel in Blountstown we were able to get a shuttle to the laundromat and the Piggly Wiggly for resupply. Again this was an oops on our part, not realizing the book and maps had changed. The map had shown a reroute through Pine Log State Forest to provide camping opportunities (though that doesn’t necessarily work if the miles don’t add up) so since we had sent a drop to the Ebro post office we did half the Pine Log SF and cut up S.R. 79 when the trail crossed it to hit the post office. Really this is the best thing to do in this section for a drop, though there are gas stations near the post office at S.R. 79 and S.R. 20. The trail goes through town and there is a Walmart, Publix and plenty of places to eat. Easy resupply. We chose to end our hike at Fort Pickens instead of at the Alabama border. If you choose to do the Alabama border route, pick up enough supplies in Crestview to get you to Alabama. We were going to resupply for the last stretch but since Chris’ dad was coming to pick us up we skipped this resupply. If needed there are several places in Navarre to get supplies. There are plenty of other places to resupply, some further off trail than this. These are just what we optioned to do and feel like they worked best for us. A little further planning on the Perry thing might have made us carry a few extra days of food out of White Springs, but it all worked out. I think one of those hiker-to-town bandannas might work out for hitchhiking on the FT.
Road walks will be a fact of life on the FT. We didn’t realize how much there was until we started looking at the maps the closer we got to particular areas. Some of the road walks will be on quiet roads but others will have high speed traffic with no shoulder to walk on. Sometimes the grassy median will be sloped and it can be cumbersome to walk. It’s just a fact of life until the trail can be rerouted off the roads. Many of the road walks are due to private property and the lack of access to land in those areas. If you are interested in particular areas to stealth camp on some of the roads, please email me and I can give you a decent idea of areas near the road. Some roads actually have a bit of a buffer areas with shrubbery that provide cover for your tent, others not so much. In addition to the roads other areas like levees and forest roads are not taken into account of the total road walk mileage. In the south, levees will be common to walk on and are comprised of crushed limestone. Some areas like the Lake Butler Forest will have forest road detours around nasty logging areas where the trail is supposed to go through. I highly recommend taking the white blazed alternatives as the real trail sometimes follows logged areas over grown with blackberries and water filled troughs. I do not recommend the western loop around Orlando as there is a greater percentage of road walking than on the eastern loop. But, it’s up to you and what you want to see. While Florida winters are typically mild, it can get to near-freezing or freeze, especially the further north you go. Light winter clothing is recommended. It will typically warm up during the day and be pleasant, but the mornings and evenings can be chilly and on those freezing nights, long base layers will be wanted. As for rain, in general it doesn’t rain much, though when a front comes through storms can last a few hours or all day. Rain gear is a must. Aside from typical gear (tent, cooking stove/utensils, sleeping gear, etc) you will definitely need two pairs of shoes. If you can make camp shoes double as water shoes, go for it. Since you might be walking in mud for several miles, such as the Big Cypress area, a good pair of shoes that can handle mud and water for long period of time will help. Fuel can be harder to come by here. We followed USPS regulations and shipped the one cannister allowed via ground delivery to our drops. But if you are doing alcohol stove you should be able to find fuel at any gas station or grocery store. If you are interested in hitching more, then you could probably get to bigger towns with a Walmart or the like to get your fuel. Hiking poles are also something of personal preference. You don’t need them to help propel you up a mountain but they still come in handy for trips and pushing overgrown brush off the trail. We like using them. 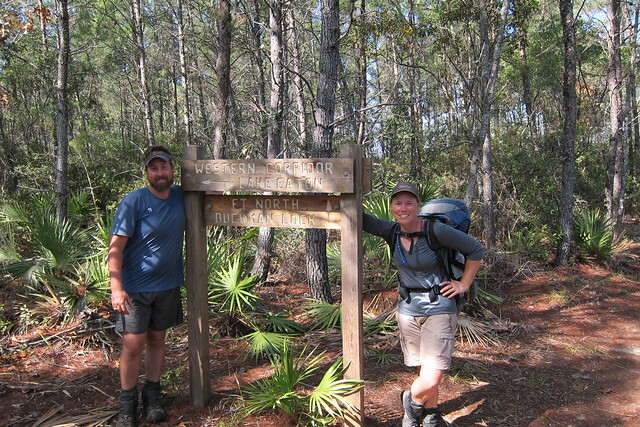 Life on the Florida Trail is vastly different than on the AT or busier long trails. With only 5-20 thru-hikers a year and not very many day hikers except in high use areas, expect to go days without seeing anyone. Most of your encounters will be with hunters or fisherman. Since there is a lack of foot traffic there is also not the abundance of hostels or showering opportunities. Get used to be smellier than usual! We went two weeks, several times, without a shower. A surprisingly good place for a shower is the Avon Park Bombing Range at the Fort Kissimmee campground. There’s a solar shower that will be a great place to rinse off. Other good shower opportunities are at the 88 Store in Ocala National Forest and the Camel Lake campground at Apalachicola National Forest. Cell phones for the most part work well. The one place I remember well that we didn’t have good access was in the middle of Big Cypress. There may be hit or miss places as you go but cell reception is decent. Aside from a Bass Pro Shop in Fort Lauderdale, there aren’t really any good outfitters along the trail…well, I guess aside from Travel Country in Orlando. That would be your best bet in an emergency for getting something backpacking related. In White Springs we had a new tent sent to us overnight from Travel Country because ours started leaking. But, as for easily accessible outfitters, there aren’t any. Now, in Lake Butler there is a hunting outfitter that has hunting gear and bug repellent, but not real backpacking supplies. They are friendly so drop in and say hi and tell them about the trail. You will be in Florida black bear territory most heavily in Ocala National Forest, but other areas in the panhandle and down in Big Cypress also host bears. Definitely hang your food when you can. We’ve actually had more trouble with ants than any other animal, so that is the best reason to hang your food! We saw several bears in Ocala. Also keep in mind that, particularly in Big Cypress, Florida panthers roam the area. Sightings are rare but the may be out there! Consider yourself lucky to see one, but be sure to stay at a safe distance from them. Bugs are minimal on the trail this time of year, but sometimes noseeums or mosquitoes might bug you. Carry a small bottle of bug spray for comfort if you are interested. Good article. I am planning to do some overnight on the FT for the first time this fall…..near ONF. This info was very helpful. Thanks. Wow, what great info! I’m adding the FT, or at least parts of it, to my to-do list. Thanks for the post! Thanks for taking the time to put this together. Good info that I’m sure folks will find helpful. I’m going to be hiking some sections in the panhandle this winter, and then continue to go farther south each year. Thanks again! Good, basic info on the FT. Having worked for FTA several years ago, I know that the route does change and that logistics can be a nightmare. Also, just wanted to add, that there is an outfitter in Tallahassee called Trail & Ski. They are very friendly people, and I’m sure if you called JC with your problem, he would do whatever was needed to help you out. Thanks for doing this! I’m thru hiking the FT beginning in January 2012. One of my biggest concerns is the resupply options, because admittedly I am not the best at logistics. The information you have provided is very helpful. Thanks again. To add to Jim Davis’ comment: J. C. Gayhartt, the owner of Trail & Ski in Tallahassee is very supportive of the Florida Trail. Their phone: (850)531-9001. I’m on FTA’s trail angel list, and could possibly deliver something from T&S to a hiker, at St. Marks or nearby trail crossing anywhere from J.R.’s store at Aucilla River to Medart area. Stay with family, im looking to make some hiking friends and maybe even do this trail. Great article with a lot of useful information. I’ve been studying up on this particular trail since I’m traveling to Florida soon and want to try and do it while there and I have the free time! I love hiking but have never done it in Florida before (I actually had no idea you could until a few weeks ago!). The first part of my trip will be complete relaxation in Palm Bay, right on the beach. Staying at the Palm Bay Hotel (www.palmbay-hotel.com). Cheap and close to the waves! But the second half I’ll be hiking this and couldn’t be more excited! I live in the Chuluota area and they did move the trail away from there and it is now circling around the community. Whree the FT and the Flagler Trail meet if you turn to the left , south on the Flagler Trail , it is about a 1 1/2 mile walk to the Chuluota Grocery. A family owned store. At Lockwood road in Oviedo there is a short walk to the south from the power lines to a Publix Grocery Store , Walgreen’s and some fast food places. I enjoy the central Florida sections of the Florida Trail and since there are trees everywhere it is a Clark Tropical Hammock ( totally bug proof ) for me when camping. Thanks to the trees I also use a wood burning stove ( the Solo Stove ) for cooking and have never ran out of fuel. I enjoyed reading your article and there is a lot of good information in there for anyone wanting to hike the FT.
Hey guys, this is Barnabas from the Appalachian Trail in 2010. 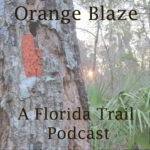 I was wondering if you thought it would be possible doing a southbound Florida Trail hike? I live in Tallahassee, so it would be convenient to just leave from the a couple hours away. Let me know your thoughts. It’s pretty funny doing research on this trail and then finding a post by you guys, can’t believe you beat me to it! There is a Bass Pro Shop in Orlando near International Drive and a Gander Mountain in Lake Mary. If there was any thing about your thru hike that you would change if you did it again what would it be? How often did you run into snakes on the trail? I’ve been doing little day hikes in the Panhandle where i live and thinking about doing the FT. Today while I was out I almost stepped on a cottonmouth and a canebrake. I’m a little hesitant now as I’ve never been that close to venomous snakes in my life and a little freaked out by them. Thoughts? I like to hike and camp but my back is a mess and I can’t carry stuff on my back so I have rigged up a carrier for my things that rolls on wheels. It is really light. I have had to drag it through a few areas. Do you think I’d have a problem? I want to hike the hole trail. what is you r personal favorite section?